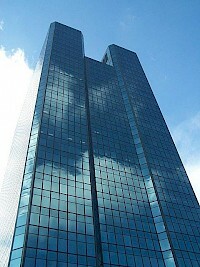 Fifth Third Center at One SeaGate is the tallest building in Toledo, Ohio. Until 2006, the building served as the world headquarters for Owens-Illinois. In 2007, Fifth Third Bank moved their Northwest Ohio headquarters to the building. Costing $100 million, One SeaGate was built as the centerpiece of the SeaGate project in downtown Toledo. Groundbreaking took place in May 1979, and was officially dedicated in June 1982.